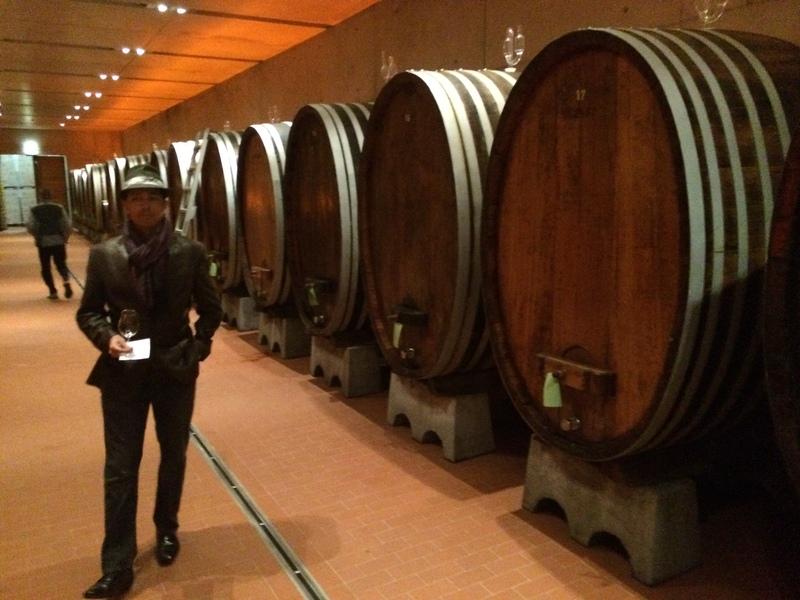 In the continuation of our journey through Germany, we stopped by Kloster Eberbach in the Rhine and were hosted by the Director of Oenology Ralf Bengel. It was originally founded in 1136 by Cistercian Monks from Burgundy and the Kloster, which is just up the road, is impressive as is the small prayer chapel that is along a path from the Kloster to the vineyards. Ralf says “With 800 years of wine cultivation, we have a great responsibility to the vineyards.” They have 65 different blocks including 30 hectares of the original “Clos” of the Kloster. This was a very impressive winery and is one of the largest in Germany, farming 250 hectares, 80% of which is…you probably guessed it… Riesling. Some Pinot Noir and Pinot Blanc (Spätburgunder and Weißburgunder respectively in German) make up the remaining 20%. One trend I saw with Pinot Noir is that the wineries we visited routinely destemmed the fruit. Ralf attributed this to the quality of the stems not being the same as in Burgundy. He said it would bring more green harshness to the wines and that was not what they were aiming for. It was interesting to note that both in the Rhine and Pfalz the tanks that were used for Spätburgunder had pneumatic punchdown devices inside an enclosed stainless steel tank. It was not something I had ever seen before but it was fascinating! 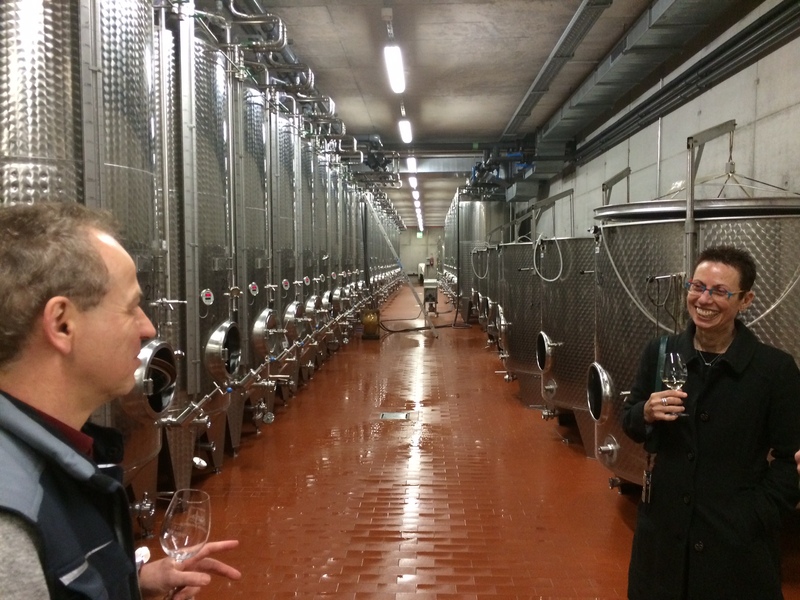 The winery at Kloster Eberbach is all gravity flow meaning the fruit is received up on the top of the winery then it is dropped to presses (or tanks if red) on a 2nd level then down to the lowest level for fermentation and aging. The highest quality Rieslings are allowed to sit in the press for some skin contact then are pressed off for settling before fermentation. Juice clarification is all completed by gravity because they have found that centrifuging the juice has hindered clarification post-fermentation. 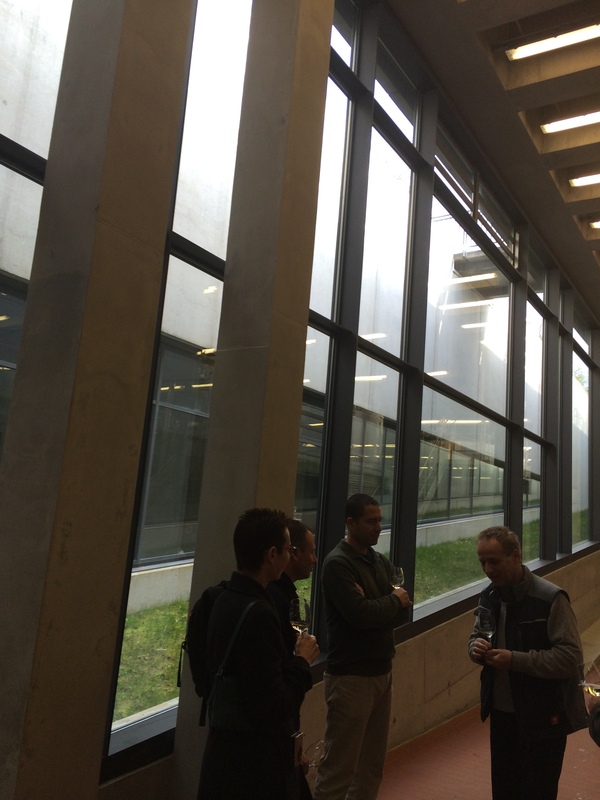 Apparently in Germany it is considered inhumane to have people working where there is no sunlight so the government required the winery to put in these large windows and a ramp from the upper level down to the bottom so natural sunlight could enter the cellar. It also makes for a much less drab atmosphere. This is their main fermentation room for Riesling as well. The winemakers here do not taste each individual fermentation. The fermentations are monitored by computer which measures their CO2 output and sugar depletion. If one of these measures starts to veer off course then the winemakers step in to assess the situation in person. It seems like a brilliant solution to fermentation monitoring however I still wonder how they know if a fermentation is producing sulfides or not. I assume that can only be assessed in person. The top lots of Riesling are also fermented in the traditional Rhine Stück (1000 L) pictured below with Martin looking daper in front. The Riesling has yeast added and is allowed to ferment for several months in some cases. The wines then stay on the lees until bottling which could be close to a year for the top lots. Very floral and peachy with flinty minerality but more generosity on the palate than typical Mosel Rieslings however still a very fresh finish. Delicate and aromatic with soft supple tannins and juicy fruit with a hint of rocky minerality on the finish. On a completely unrelated note my old stomping grounds of New York State had a banner week this week between New York State winning Wine Enthusiast’s Wine Region of the Year and Cornell’s College of Ag and Life Sciences (CALS for short from which I am an Alumni) was named number 1 college in the world for the Best Global Universities for Plant and Animal Science by US News. Way to go to the Empire State!